John Bohnenberger (1926-2012). John Bohnenberger was born in Chicago, Illinois. When he was fourteen years old, John's family moved to the West Coast and settled. After high school Bohnenberger served in the U.S. Army and then returned from duty to live in California. For many years John Bohnenberger worked as a Government employee, but also found plenty of time to paint watercolors. He is a self taught artist and has worked in a variety of painting styles ranging from tight and representational to very loose and abstract. 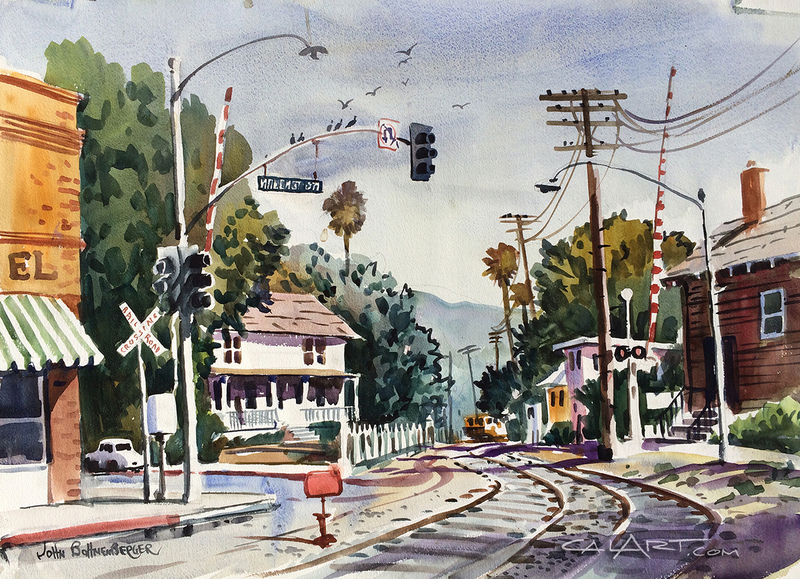 John Bohnenberger's paintings of boat harbors and regional cityscapes have brought him many awards, but other subjects including a series of California suburban neighborhood scenes are also exceptional and have received much attention. Most of his works are large, painted on paper size 22 "x 30 " and are done with transparent watercolors. John Bohnenberger biography courtesy Gordon T. McClelland - Author, California Watercolors 1850-1970, An Illustrated History and Bographical Dictionary. Original California Regionalist watercolor painting by John Bohnenberger.